Mark Searle, frames & furniture conservator at Knole House (NT), explains the process of restoring a Victorian compo frame from the 1880s in the collection of the Guildhall Art Gallery, London. This article was originally given as a paper at the Melbourne symposium, Frame: Concept, History & Conservation, held under the auspices of the AICCM at the National Gallery of Victoria, 24th-26th August 2016. 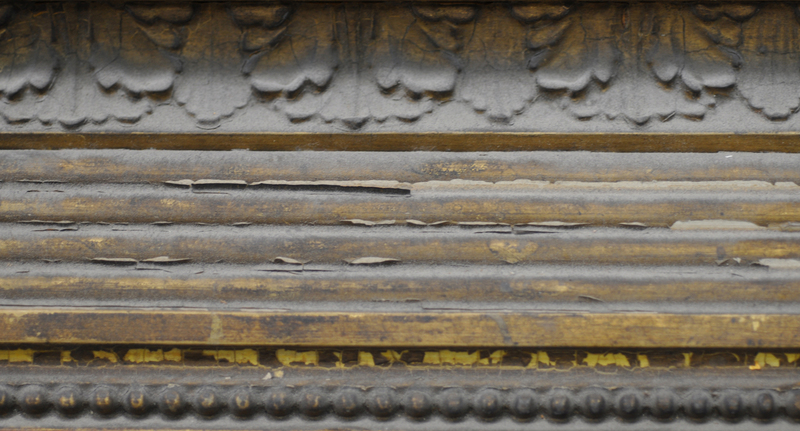 This treatment was carried out whilst the craftsman was completing a 6-month internship in frame conservation at the Guildhall Art Gallery in London. 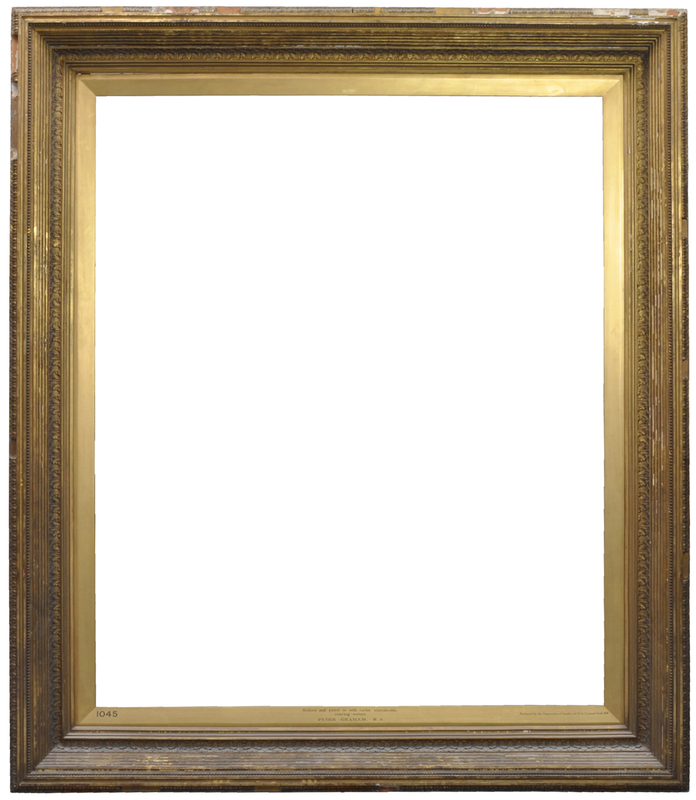 The frame is a majestic  example of a late 19th century English compo frame, in a NeoClassical Revival style. 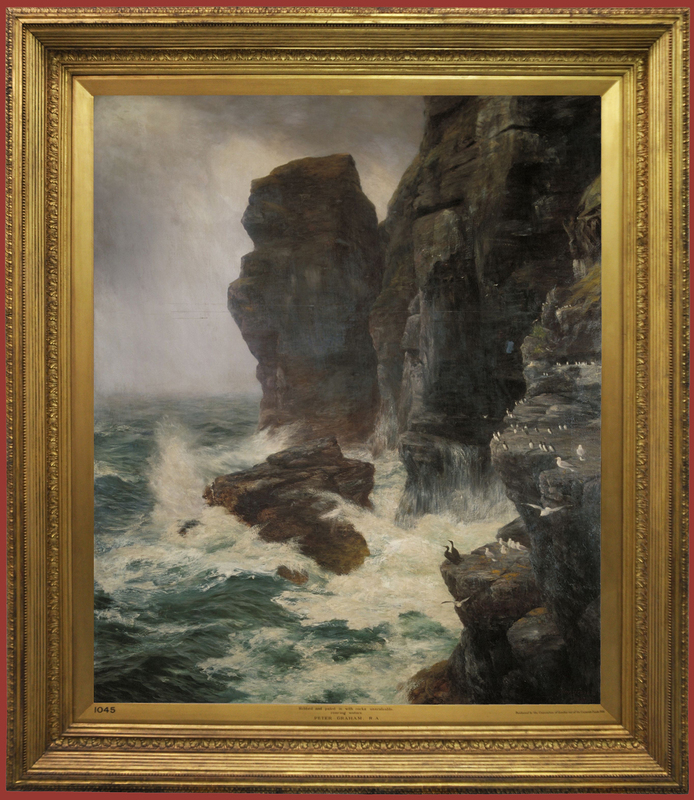 It was almost certainly the original frame for the 1885 painting, Ribbed & paled by rocks unscalable & roaring waters, by the Scottish artist Peter Graham. The treatment was completed for an upcoming exhibition at the Guildhall. This frame is a proud display of Victorian craftsmanship, using the material and motifs in common use at the time of its construction. It has a pine substrate; the profile is relatively complex, with each member constructed from four pieces of wood – the laminated outer frame, an inner frame and a slip or inlay. The separate members are attached with mitred joints. The frame is enriched with several sections of NeoClassical Revival compo ornament. Compo – or composition – a casting material composed of whiting, size, linseed oil and rosin, was pressed in reverse-carved boxwood moulds as a substitute for carved ornament. This man-made material became particularly popular in 19th century Britain, where it served as a simple and economic way of manufacturing large numbers of highly ornamented frames for a growing middle-class market, displacing the hand-carved wooden frame which had been used to display and protect paintings for more than 600 years. 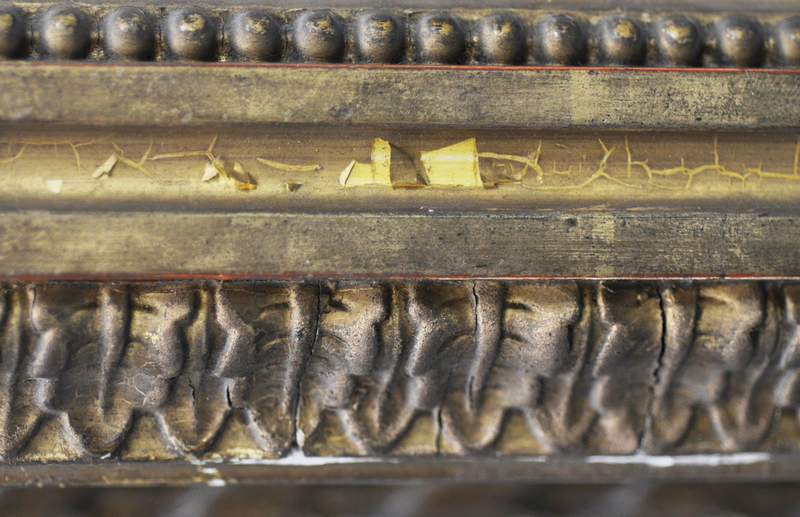 The frame was in a highly deteriorated state before treatment. There was extensive compo loss in the ribbon-&-stave and leaf-&-tongue mouldings. It was estimated that around a tenth of the ribbon-&-stave moulding had been lost or replaced by poorly executed fills. There were numerous areas of flaking oil-gilding in which small sections of gold were pulling away from the yellow tinted oil-size and white ground-layer beneath. 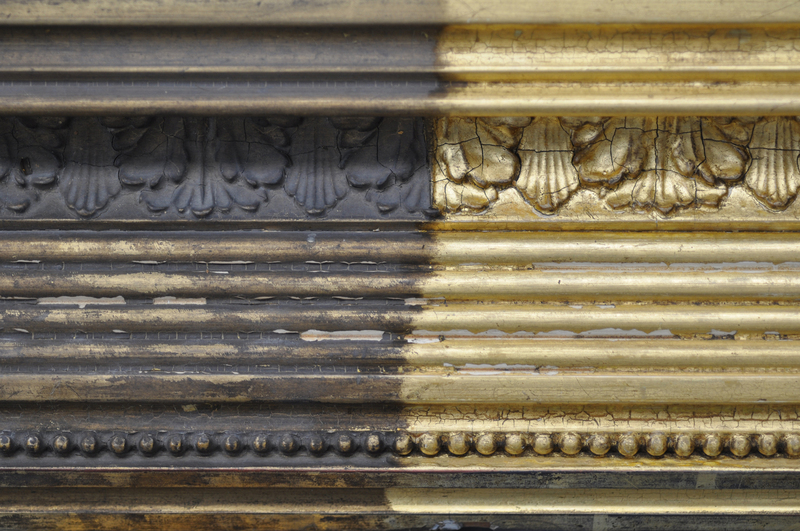 Darkened and distracting bronze paint had been applied across the frame in a historic treatment. This was probably an ill-advised method to brighten up the frame and disguise damage and loss. The evidence of two different tints of bronze paint suggested that it was likely to have been applied in more than one treatment. There was a thick layer of dust and engrained dirt, particularly on the back of the upper rail and the front side of the lower rail. On the one hand, the ‘traditional approach’ utilizes materials and methods which have been in use for hundreds, if not thousands, of years. These include popular materials in frame conservation, such as animal glues and natural resins. In practice this approach often results in using the same materials as those present on the original. In contrast, the ‘non-traditional approach’ takes advantage of synthetic, man-made, polymer-based materials. The development of non-traditional gilding methods began in the 1980s and has become increasingly popular in the 21st century. By using similar materials to those employed in the construction of the frame, the treatment would not jeopardise the frame’s integrity, as it would not be distorting its material make-up. In this sense the treatment could be considered as helping to continue the frame’s life-history rather causing a fundamental change. The frame is a highly complex composite object with multiple complicated decay mechanisms. Thus, adding a non-traditional constituent into this system would inevitably create a degree of uncertainty regarding the long-term success of the treatment, when compared with using traditional materials which are already present in the frame. However, it was also considered vital that this treatment did not comprise a singular, rigid, inflexible methodology. Thus, for stages in this treatment non-traditional materials were also utilized. This is because their greater suitability and ‘retreatability’ outweighed the overarching principles of the traditional approach. The treatment began with a removal of the dirt and bronze paint. The cleaning method depended on the type of gilding present beneath the dirt layer. The oil-gilt sections were cleaned to dramatic effect with swabs of 5% tri-ammonium citrate in de-ionized water and rinsed with swabs of de-ionized water; whilst swabs of saliva were able to remove the dirt from the top-edge fillets, without damaging the vulnerable water-gilding beneath. After much testing the only material which was able to remove the stubborn bronze paint was Nitromors (a commercial gelled benzyl alcohol based stripper). It was applied with swabs for a 1-minute application time and cleared with swabs of white spirit. The ‘traditional approach’ was rejected for the consolidation of the flaking oil-gilding, with Lascaux Medium for Consolidation 4176 favoured, injected using a syringe. This acrylic dispersion was chosen due to its superior working properties; it had higher strength and penetrated further under the gold leaf when compared with traditional materials in tests. It is also (at least theoretically) ‘retreatable’, as Lascaux 4176 can be made soluble again in acetone or IMS. The loosely adhered ribbon-&-stave and leaf-&-tongue compo mouldings were stabilized with fish glue, applied using a spatula. This glue had a high strength as well as the desirable longer drying-time. The compo was kept in position using modelling clamps while the glue dried. The compo was made using a traditional Victorian recipe. The ‘traditional approach’ was favoured here because, due to the great scale of loss in the compo, it was deemed that using a non-traditional material would cause an unacceptable change in the material make-up of the frame. Rigid silicone rubber moulds were made from corresponding surviving sections of the ribbon-&-stave and leaf-&-tongue ornaments. The newly-made compo was pressed into these moulds using a book-press. The new compo fills were trimmed and cut to the size of the losses and adhered in position on the frame with fish glue. 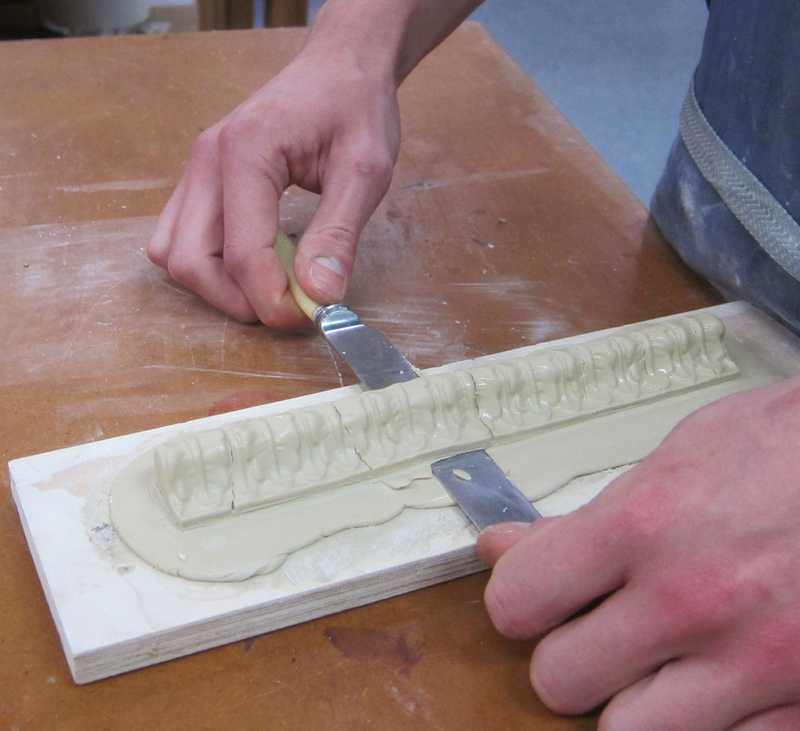 The whiting putty fills on the fillets were prepared and gilded using traditional materials and methods. The black and red bole layers on the fillet were replicated using propriety bole and rabbit skin glue, and colour-matched with dry pigment. The fills were then water-gilded, distressed and toned with watercolours and pumice powder. However, through tests it was found that the quicker, easier and more effective method for gilding and toning the compo fills was using non-traditional materials. Also, if future differentiation of the original and the new compo were desired, it would be easily detected through the divergent solubility of the individual finishes. The tinted oil-size layer of the original compo was matched using Golden Fluid Acrylic colours and a drop of Primal WS24©. The compo fills were then water-gilded and distressed. The newly-distressed gilding was sealed with 5% Paraloid B72 in acetone and toned with Golden Fluid Acrylic colours and a drop of Primal WS24. The complex patina on the surviving compo could only be successfully emulated by multiple washes of tone. This late 19th century frame is now clean, stable, ornamentally complete and aesthetically pleasing. It has been reunited with the painting by Peter Graham, and will be displayed inthe Guildhall Art Gallery. 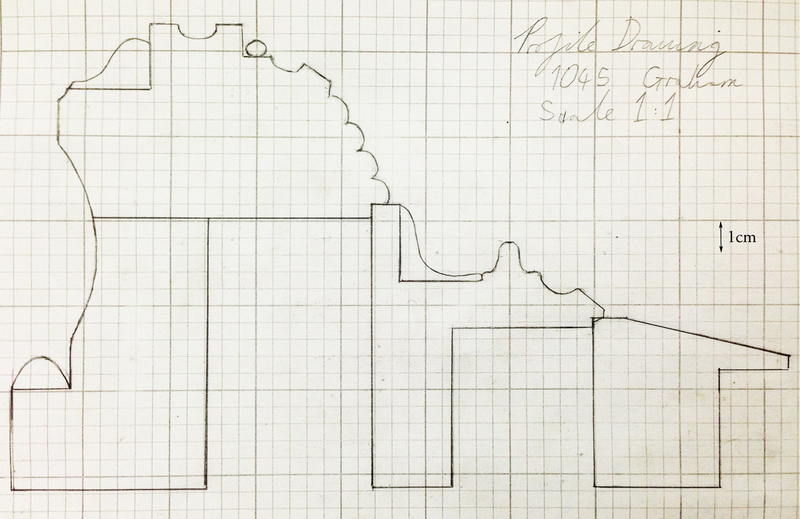 During this project, it became increasingly clear that to do justice to this frame, each stage of the treatment required a tailored approach to suit the particular conservation issues in the best way. It can be concluded that both traditional and non-traditional materials and methods have important places in frame conservation, and can be used in together, rather being considered as opposing and antithetical approaches. I would like to express my thanks to Caroline Oliver and Robert Zilli for their supervision and advice throughout this project. I would also like to thank the rest of the Guildhall team, NADFAS and Radcliffe Trust for enabling this internship. Mark Searle completed a post-graduate diploma in conservation at the City & Guilds of London Art School. 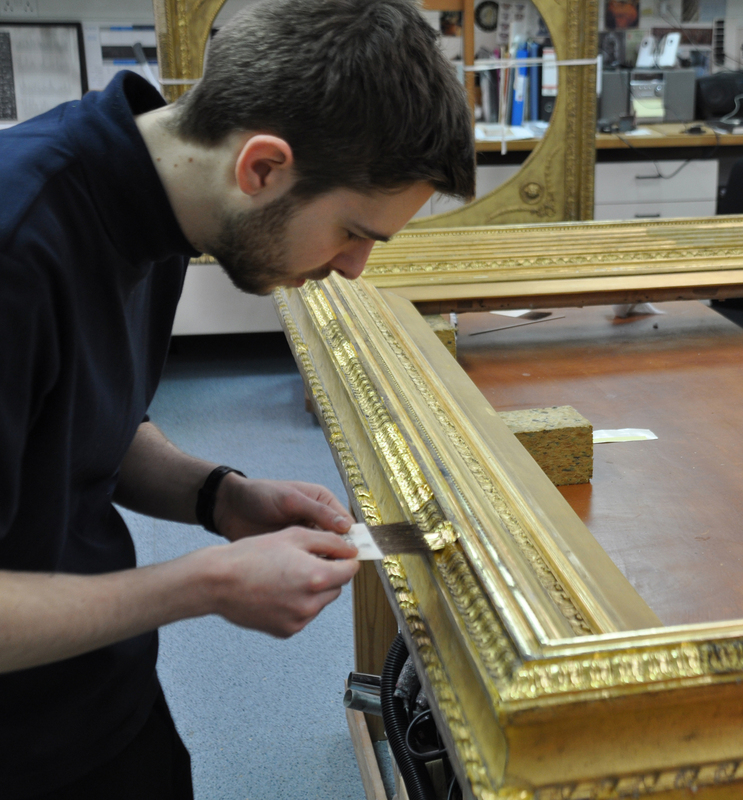 In 2015 he undertook an internship in frame conservation at the Guildhall Art Gallery. He then worked in frame conservation at the National Maritime Museum, and is currently a frames & furniture conservator at Knole House (National Trust). What source did you use for the ‘traditional Victorian recipe’? I am currently doing research in very early 20th-century composition ceiling ornamentation. I hope to post an article on compo recipes at some point. Beautiful work. Do you have any idea how many hours it took to complete the project?